I always wanted my own map room. Frescoes all over the walls, and a floor that slides open to reveal a secret 3D James Bond diorama of all the nuclear installations in the world, with blinking red lights. I would also like guys in black suits to run alongside my motorcade, and believe that the only way to enter a cocktail party is to rappel through the window in an orange jumpsuit, but now I'm off topic. The Palazzo Farnese; what's not to love? The contributions of Antonio da Sangallo the Younger, Jacopo Barozzi da Vignola, Giacomo della Porta and in particular, Michelangelo, tend to take center stage when speaking of this wonderful Palace. No less spectacular though is the grottesque ornamentation (pictured above). this absolutely stellar work received the spotlight in an issue of FMR magazine. For those who would like to dig deeper, I posted a set of large images of grottesca from the Palazzo Farnese here. 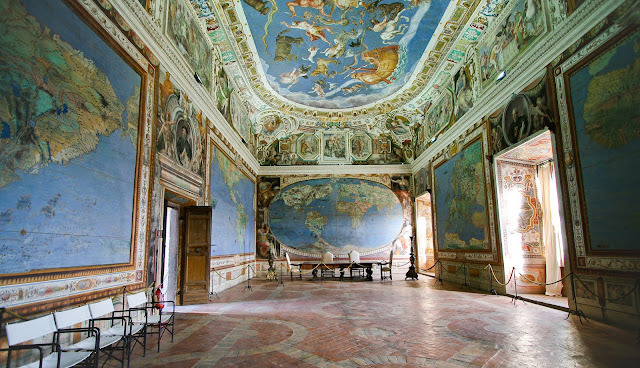 By the way, If Italianate painted ornamental ceilings are your thing, take a look at these amazing 3-D panoramic tours of the Quirinal Palace (Palazzo del Quirinale), the Italian Presidential home. Scroll down the page and click on any one of the thumbnails for a breathtaking trip to Italy. 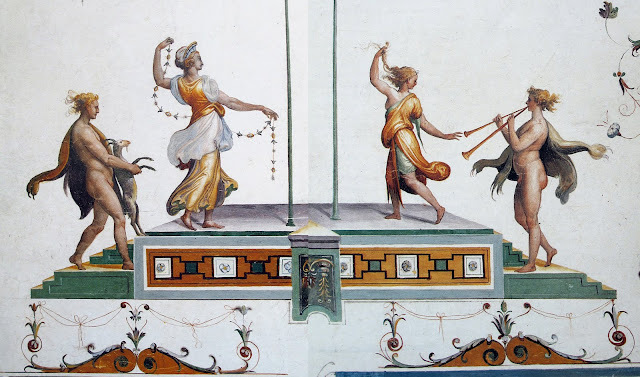 You may also like to view this post on my blog about Italian painted interiors, with large images. gonna need a bigger house i think. i, too, have always wanted a map room, but with made-up place dotted with cities that have naughty double entendres for names. 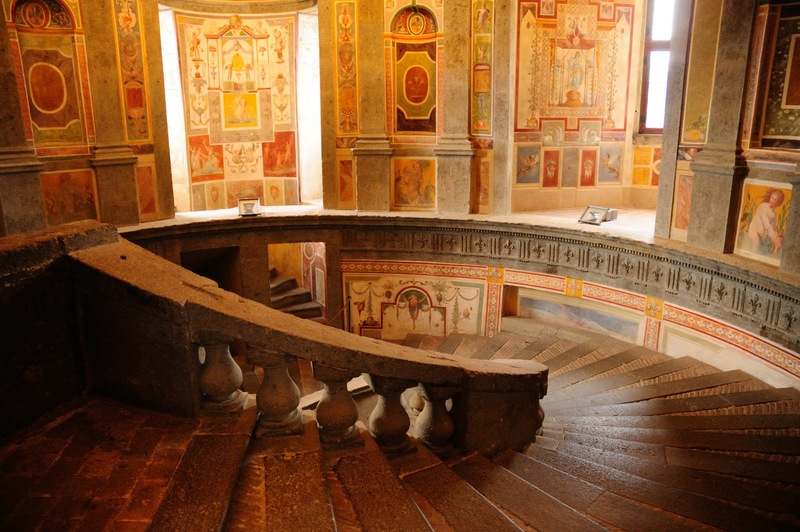 Thank you for your piece on Palazzo Farnese. My wife and I recently returned from an 8 month stay in Soriano nel Cimino (www.OurYearInItaly.blogspot.com/)just north of Caprola. we visited the palazzo several times and each time was a great experience. It's only about an hour north of Rome by car and is a "must see" for anyone visiting Central Italy. I started salivating the minute I saw the Farnese was posted and am eating it up! Then I read that you were able to photograph many of the images from an FMR magazine? I have everyone of them in Italian and English but I can't put my hands (of rather, find) this issue. Would it be terribly inconvenient for you to find it again and let me know the issue number or date? I've lived in Rome for years and have many books and photos to share on a Blog as soon as I can get myself organized... HA! If you don't remember, it's OK, I'll still be a big fan and come back again and again! Near the end of the film "Stealing Beauty", Jeremy Irons has a great line as he's being taken away..... "all this beauty... weren't we lucky?"